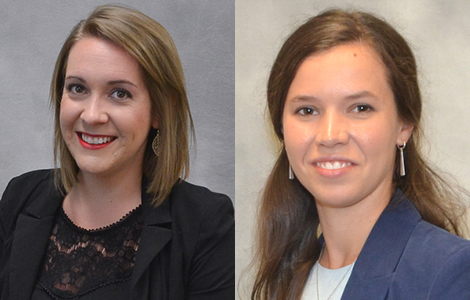 The MU Sinclair School of Nursing is pleased to announce Laura Remy, MPH, RN, of Kansas City, Mo., and Maureen Varty, BSN, RN, of Washington, D.C., have been selected as National Institute of Nursing Research (NINR) funded T32 Health Behavior Science Pre-Doctoral Fellowship recipients for 2017-2020. As a PhD student, Laura is studying the development of behavioral interventions to enhance the outcomes in vulnerable populations living with chronic health conditions, such as HIV. She is mentored by Maithe Enriquez, PhD, RN, ANP-BC, FAAN, Associate Professor of Nursing. As a PhD student, Maureen is studying health behavior interventions related to improving transitional care for adolescents and young adults with chronic disease. She is mentored by Lori Popejoy, PhD, APRN, GCNS-BC, FAAN, Associate Professor of Nursing. The SSON is one of five departments at the University of Missouri with an NIH-funded T32 training grant. Moreover, the SSON is one of only 16 schools of nursing nationwide to receive an NINR-funded T32 grant. The T32 Health Behavior Science Pre-Doctoral Fellowship provides financial support (stipend, tuition/fees/ health insurance, travel to conferences), mentoring and research skill development opportunities to goal-directed, full-time nursing PhD students dedicated to pursuing a research career in health behavior science.